Schutt began with making tools, basketball hoops, and the facemask. Late 80’s bought Bike and began the helmet business. Dr. Vaughn adds to previous question about medical professional at games… “Most of the time athlete spends on the field is not during games, but at practice.” Great point by Dr. Vaughn. “Schools are critically important in this issue, especially in return to school.” Nurses or other personnel (athletic trainer) are the first to see this issue. Q: Should there be a medical professional at all games? A: Yes from all that answered. Q: In the track world have any of your friends gotten concussions? Q: How important is baseline testing? A: Almquist, its a great “tool” (as I have always enforced), he uses the neurocognitive testing to see things they cannot see, how the brain is working, and it is not the be all end all. Joe Clark then followed up Almquist’s assertions. Clark then said those that are familiar with the patient, again the need for an athletic trainer. Almquist is getting a bulk of the questions… And as this man has done, not only today but throughout his career, presents the most precise answers. Josh (Pop Warner) would love to have a “certified athletic trainer” at all events, but cost is prohibitive, they have EMT’s, but they recommend that everyone have an AT. Almquist making point that front line intervention is needed, certified athletic trainers are the answer. Now AT’s are working with coaches, administration, guidance counselors, and teachers to address the issue from all angles. BOOOOOM, Almquist corrects host on “trainer” comment. We are a medical professional!!! Athletic trainers are needed to manage the kids, and are needed in all communities, and set up all the right parameters, approved by physicians and EVERYONE sticks to those rules. Almquist is killing this!!! That a boy!!! To the host… It is Athletic Trainer, not “trainer”. Nehemiah telling story about returning to play too soon in Chicago, “supply and demand” and how his team doctor stood up for him. “You think your fine… speed and force with the swelling in the brain cause problems,” he was out for 2 weeks after that. Ms. Quinn is SPOT on saying mouth guards attempt to protect against the hit to the jaw, in an uppercut type force. What she says make good sense in theory, however there are no significant, CONTROLLED studies that prove this. “.001% less chance of concussion is better than not having it.” I agree. She might be off saying this type of blow is one of the most common in getting a concussion. I will give it to her, her product is very attractive to the youth. I think I like some of her stuff, but she is of course selling a product. However, she is making great points about the mouth guard, especially that the reason for them, the number one reason is for oral protection. Pop Warner (wish I had his name, fill-in for Sam Mutz) rep says that language taking parents out of return to play decisions is very helpful. Almquist answers question about increase in concussions. Not sure if there are more or not, but awareness is higher, using “bell rung” as example. As I have stated multiple times, Almquist says REST is the key, but recognizing it is important. New paper released about concussions in Fairfax Co. in Virgina, concussions trending up, but he thinks it is due to awareness. Nehemiah explains the root of returning to play too soon by men and competitors, the “machimso” factor. Using Hines Ward as an example, solid example. Questions coming in… Bobbie slants the answer to mouth guards, but is correct in telling us that education is key, and parents need to be AWARE. Mouth guard angle, stick with the helmet. Now the “Business and Organizational Side of Concussions”, panelists are mouth guard rep, NFL WR, Athletic Trainer, and a drop in guest. Renaldo Nehemiah tells us he is here based upon a concussion he sustained. Jon Almquist speaking for athletic trainers, and laying out what is needed and why an AT is on site. The Pop Warner rep is interested in keeping youth football, cheer and dance safe for everyone, via coach education and rules. Public is “on notice” about concussion, the effect of them, now and going forward. Responsibility is being placed on everyone to take care of this injury. Congressman Miller began the investigation in high schools back in 2008. Found that “very little was being done… while the impact on young men and women was very serious.” Federal standards needed to be set to protect them. Tremendous support all-around for the bill and should be passed. No “ups” for calling athletic trainers, “trainers”… Thanks public official. Joe says the “number one tool in assessing concussions is YOUR brain”, GREAT point!!! Very good presentation by Dr. Vaughn, now Joe Clark reinforces what has been presented and gives a great “real life” example of a concussion, using a bruise on the arm as an example. Twice we have heard, “you can return to play when it is safe”, pretty broad but it is the good rule. And big “ups” for saying athletic trainer versus the “trainer” tag most use. This powerpoint or ones like it NEEDS to be presented to all parents, teachers, coaches and athletes!!! 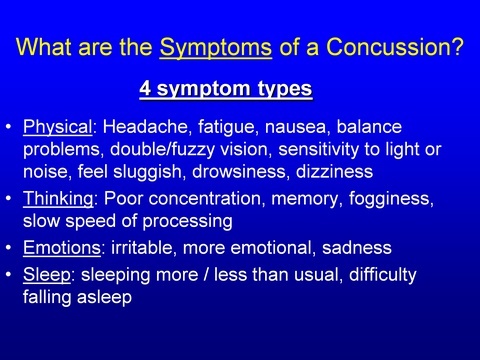 Here is a screen grab of the symptom types Dr. Vaughn is presenting. Some sweet jazz music greets us… Oh, make that some blues, NICE!! !